I’ve lived in Chicago for seven years now, and it feels like nothing, like I just got here. Conversely, the roughly equvalent span of seven years of my childhood during which my baseball cards came to me seems immense and inexhaustible. The writing at this site is, among other things, my surrender to the idea that it will take the rest of my life to approach saying everything I want to say about those years. Maybe I live an intentionally narrow life in the present to leave myself time and energy to explore the past. Likewise, I don’t collect cards anymore. I don’t have room for them, physically or emotionally. But I can make room for the occasional stray, like this Frank Castillo card that I found a few months ago on Western Avenue, my fourth and probably last Western Avenue baseball card find. I’ve been looking since then and haven’t found any others, on Western Avenue or elsewhere, and I just moved to another neighborhood that’s not very close to Western Avenue. My new neighborhood is on the Red Line, however, so I’ll be a short shot away from Wrigley. 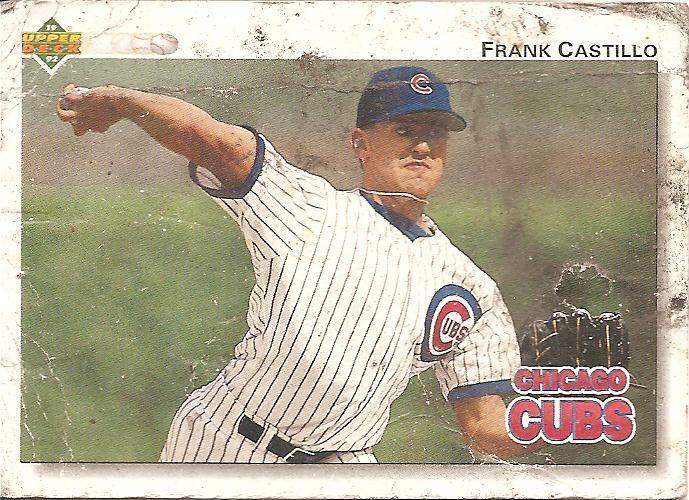 I’ll be seeing the 2011 Cubs in person at least a little, so I’ll get to see if this pummeled Frank Castillo card will turn out to bear any resemblance to the Cubs’ fortunes in their 103rd straight season of wanting. Everybody knows what wanting is. It’s very close to the feeling of being alive, or else it’s so often present that you come to believe it’s the feeling of being alive. I go through most days wanting and not even knowing what it is I want, and this feeling only rarely goes away. It doesn’t go away with the seemingly logical counterpart to wanting: getting. But sometimes it dissipates if I can surrender to a kind of purposelessness, a way of wandering open-hearted through the world. Going for a walk can bring this to me, especially in a city, where the world seems to show its randomness more readily. Yesterday on a walk I stopped wanting when I spotted a cheap, dark masquerade-ball type mask lying on the sidewalk. A couple days ago I stopped wanting when a disheveled young man who looked he had a lot on his mind walked by me on Chicago Avenue, dragging a golf club behind him like a stiffened, dogless leash. One of my favorite memories so far of my seven years in Chicago is from when I was sitting in the bleachers for a Cubs game, which is somewhat like surrendering up your individual body in exchange for a much drunker, louder collective with thousands of limbs. A guy sitting in front of me who had been keeping score as he pounded beer after beer rose for a mid-inning bathroom break, inevitably, and without thinking shoved his scorecard into my hands. “You know how to do this, right?” he muttered, and for the next inning and a half I kept track of the game for him until he staggered back to his seat with two more overflowing beers for himself. I don’t remember whether the Cubs won or lost that day. Somewhere maybe there’s a scorecard with my notes mixing together with someone else’s notes, though my guess is that the drunk guy likely was unable to hold onto the scorecard for very long beyond the end of the game. Maybe sometime after it slipped out of his benumbed fingers someone noticed it lying on the street and noticed a different style of handwriting for a couple frames. Maybe not. All this is to say the 2011 Cubs will provide moments of purposelessness and wanting and will be discarded, only to be happened on later by accident, maybe, an artifact of a presiding random indifference, capable of nothing or wonder. You are currently browsing the archives for the Frank Castillo category.